QuiltNut Creations: is this thing on?? Finally back! Whew, that was just too stressful! Thankfully I still have my domain name and I didn't lose anything from my blog but yikes, that was crazy! Anyways, back to the good stuff. I bought a quilting magazine a few weeks ago; I can not remember the last time I had bought one. 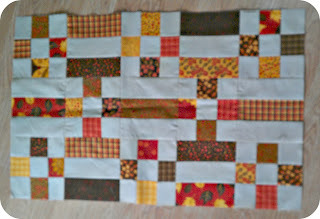 Flipping through it, I saw a quilt that I thought would be perfect for a jelly roll I bought on a whim. The pattern called for more blocks but I liked it at this size so I put the extras together and made a little table runner. 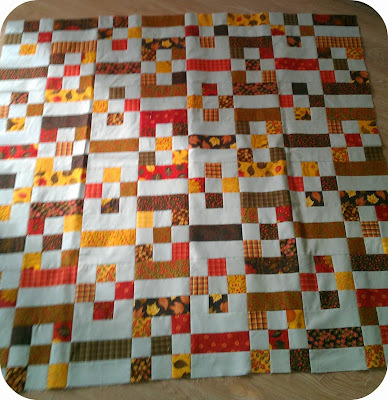 Now to sneak in some quilting time so I can enjoy them before pulling out the Christmas decorations! Yup, you're on! Nice quilt top, which magazine was that pattern in? I have a few jelly rolls to use up.